Red fish is considered a delicacy. There are several options for its heat treatment. It can be steamed, boil, braise or broil. It is necessary to know all the nuances of cooking. 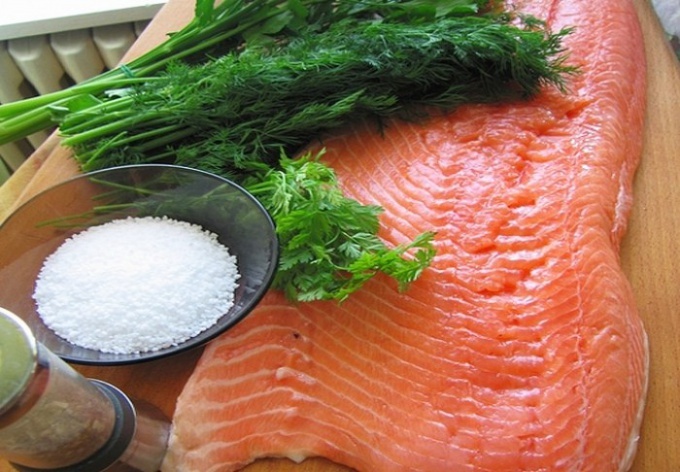 Tips will help to cook salmon correctly. If you are preparing a main dish or appetizer, pour over the fish hot water. In this case the optimal 2:1 ratio. This means that 1 kg of prepared fish you will need 2 liters of water. In order to cook it evenly, large bodies divide into serving pieces. If the red fish is small, cook it whole. Do not place it in too hot water. From the temperature difference between the skin will likely burst. This leads to the fact that the finished dish will lose its appeal. Also, this factor will affect the transparency of the broth. Cooking time for salmon depends on its size. Remember: as with any seafood, it does not tolerate prolonged heat treatment. The average cooking time: 25-30 minutes if a red fish cut into pieces a La carte. It is easy to determine the readiness of a fish's fins. If they depart, she is ready. Try to cook red fish in vegetable broth. In this case it will be soft and tender. In the water put large pieces of onions and carrots, but also roots and spices according to your taste. In the broth add the saffron. This will give the red fish a beautiful shade. The dishes are not worth the long simmer in the pot. Try to apply red fish no later than 20-30 minutes after the availability. To keep the dish until the next meal, cover the pan with a lid and store in the cooler. So the red fish can be kept for 2-3 days. When heating ready meals from the red fish do not use a microwave. Use a gas stove. Don't forget that excess water will impair the taste of red fish. Also it is not necessary to prevent violent boiling of the liquid during cooking. When cooking salmon, don't salt it before cooking. Thus, you will spoil its taste. Any fish is immensely rich in proteins, which are absorbed by the body much better than those that are present in meat. Fish is less calories, and amino acids content of meat is not inferior. And red fish is still enriched with unique ingredients like omega-3, which are essential to the human body. • Food foil for baking. Recipe 1. "Fish for your favorite". • Onion peel, wash and cut into half rings. • Mushrooms dry on a napkin. • Fry mushrooms with onions in vegetable oil. When the onions become Golden, add the butter, mix well. Cook for 5 minutes. • Pour mushrooms and sour cream, stir, keep on fire for 15 minutes. • Fish fillet with salt, pepper, sprinkle of fresh lemon juice. Sprinkle Basil and leave to stand for 5 minutes. • On a baking tray lay a paper for baking, grease it slightly with oil. Put tightly to each other the layers of fish. • Fill it with cream and put in a preheated 150 degree oven for 15 minutes. Make sure that the fish is not burnt, but just changed the color and became a pale pink. • On top of the fish place the mushroom mass and evenly it spread. • Grate cheese on a large grater and sprinkle liberally over the dish. • Place in the oven for 15-20 minutes. As soon as you see that the cheese melted and browned, the dish is ready. • Serve baked fish turns out very juicy and unique taste, with mashed potatoes and any vegetables, e.g. French beans. Recipe 2. "The fish boats". • Stacks wash, dry. Add salt, pepper, sprinkle with lemon juice and sprinkle with Basil. • Each piece is a little fry in a pan until Golden brown. • Tomatoes and onions cut into rings. • Foil shape of the boat. The edges make so large that they could hold tightly. • In each boat put on the steak. Pour the juice that remains after frying. • Pour 20 ml of milk. Put on 2 rings of tomato, ring of onion and 1 tbsp mayonnaise. 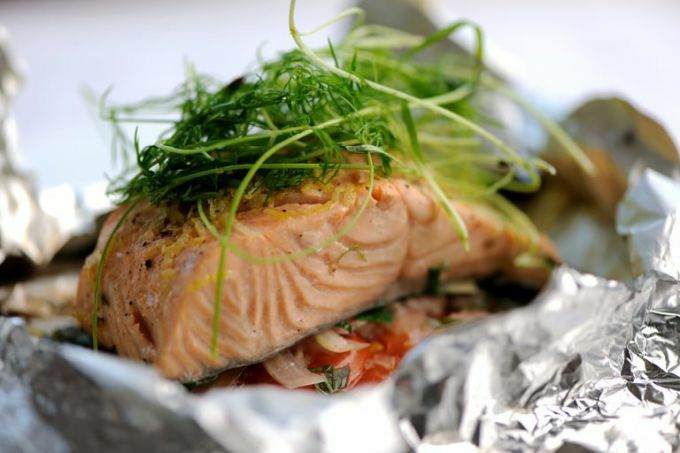 • Gently tap the edges of the foil so that the fish was closed. • Place the "boats" on a baking sheet. Put in a preheated 180 degree oven for 15-20 minutes. People who have in the diet of regular fish, less prone to cancer, hypertension and memory problems. Red fish has a unique taste and rich nutritional composition, so it is the most important component of the nutrition of a healthy person.